Our meeting on Monday 17th July was graced with a beautiful day to go wandering – which we did – down to the Clyde Street railway crossing and back photographing all manner of things along the way. When we returned to the club-room we proceeded to upload our efforts to computer and did a quick review of them and discussed other issues regarding cameras and photos that were raised. A pleasant way to spend a few hours among good company. On 2nd September a small group of us went on an organised activity ‘Gardens & Craft on Lake Macquarie’ which was an interesting afternoon with lots of photos – mostly flowers. On 18th September again a small but intrepid group went into Newcastle for a photo shoot of ‘Newcastle – New and Old’. We didn’t walk very far – basically got off the bus at Auckland St walked down to Hunter and along to the new University building. We got permission to tour the building, rode the elevator to the 8th floor and walked down – photographing inside and outside of the building from all the vantage points of the compass – looking up & down Hunter Street, over the harbour, and over the Civic Park, Cathedral, and Obelisk on the horizon in one direction and Nobbys towards the East. By the way – they serve great coffee in the café on the ground floor. Do you want to uncover the mystery of the many functions of your digital camera? Then you should consider enrolling in this class. All you need to bring is your camera and instruction manual, and cable to transfer photos from camera to computer. Please make sure your batteries are fully charged. The intention of this 3 hour Class is to explain and demonstrate the many useful features built into your camera. It is a practical hands-on session designed to expand your knowledge and improve the way you take digital photos. Learn the fundamental principles of taking better photos. This 3 hour Class draws attention to a number of basic considerations you need to get that perfect shot. You should bring your camera, instruction manual and USB cable to connect your Camera to the Computer. A number of factors that determine the outcome of a photo will be explained and outdoor exercises follow to demonstrate the affect of varying conditions. A constructive critique of these images is then shared in the classroom. Now that you have a greater understanding of your camera and learnt how to take better photos, it is time to gain some knowledge of Managing and Editing your masterpieces. This course is designed specifically for those who want a simple yet effective way to manage and edit their photos. The program comes free with Windows 10. It is easy to use and ideally suited to those who don’t want too technical a solution for straightforward everyday editing. It also provides a range of interesting effects that can be applied to your photos to give an attention-grabbing artistic look. · Cropping (to remove unwanted background OR to a desired Aspect Ratio for printing). · Sharpening (all digital photos require some sharpening before printing). · Find and view your images. Want to further expand your knowledge of a digital image/photo? There is a series of courses that have been prepared to explain in more depth, the technical make-up of an image. You will gain a greater understanding of not only terminology but how to use different tools and techniques to get an improved result. You will need a working knowledge of using a computer with a Windows operating system. These courses focus more on using manual adjustments rather than just automated processes to improve an image. Manual alterations give greater control and offer a more precise level of fine-tuning to achieve a better result (i.e. you control the outcome). Irfanview (a free program) is used for basic editing exercises, more advanced techniques will be introduced using Photoshop Elements. Photoshop Elements is a professional photo editing program and costs. Don’t be deterred by the cost, experience this class and the others following and decide for yourself. These courses use Photoshop Elements and shows how to use the tools available in good photographic editing software to overcome these problems and make you a ‘more aware’ photographer. Even professional photographers at times take inferior shots, especially if time and opportunity is restricted. Their solution? Don’t throw these away; fix them with a good photo editing program! In fact there are very few commercial photos that have not been adjusted using editing software such as Photoshop, or similar professional photo editing programs. Quite often old photographs become damaged or fade with the passing of time. This 3 hour Special Interest Class is designed to introduce you to a number of tools and techniques to professionally restore and repair old photos. Some knowledge of advanced editing software (e.g. Photoshop Elements) would be an advantage. The restoring process, demonstrated in class, concentrates on “black & white” or in digital terms “Greyscale” images, however the same processes are suitable for colour images. · Enhance images – most old photographs benefit from some form of enhancement. These improvements can be made using auto processes or one or all of the many manual adjustments available. · Replace or remove damaged parts or sections of a photograph using the “Cloning” tool. Cloning is a method of copying one part of an image to another part, or part of a completely separate image file to a different image. Different clone tools allow you to ‘paint’ the copied image with many different styles of brushes. This feature allows you to “paint out” damaged areas and replace them with similar undamaged sections. · Use different File Types and special Techniques for fine and intricate restorations. There are a number of Special Interest Classes (available on request) that are designed to enhance your skills in specific areas of photo manipulation/enhancement. A collage is an easy and attractive way to paste together photos with a common subject. These can then be printed off for photo albums or for wall display. Selection Tools allow parts of photos to be changed or improved. Do you want to add, or remove, someone or something from a photo? Maybeyou would like to bring out or tone down part of a photo? Selection tools allow this to be done. 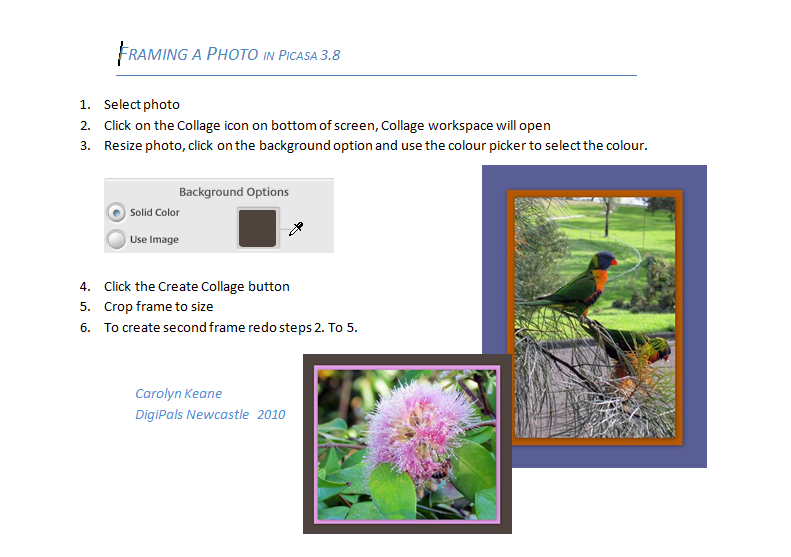 These tools are basic to good photographic programs such as Photoshop or Paintshop Pro. Layers are a basic tool in the photo/image adjustment process; that is, in improving or just being creative with photos. Selections that have been improved often become a new layer in building an improved photo/image. Photoshop, Paintshop Pro and similar programs rely on Layer processes. Montages are something like collages. Whereas a Collage pastes several images together, a Montage builds up a single, composite image from several different images using Selection and Layers techniques. This 3 hour course shows how to produce scrapbook items that can be used for scrapbooking, and how to produce a digital scrapbook. Techniques used are similar to those used in Montage work. Please note that the courses listed are for your information only and you will need to check the availability of vacancies in any course by looking at the rosters in the clubroom or by emailing contact@computerpals.org.au or if you have no email, phone 4961 6576 during office hours. Your name can only be added if a vacancy is available. You are not enrolled until we receive payment so send it in as soon as you enrol or you may miss out. The first 3 send a weekly newsletter, full of tips and useful ideas. They also keep you up to date on the camera market. I find Wikipedia very good on all technical matters and of course Professor Google is hard to beat.